Award-winning and internationally bestselling author LyndaLa Plante returns with the eighth installment in her acclaimed series featuring London's Detective Chief Inspector Anna Travis. Late at night on a notorious high-rise estate in the London Borough of Hackney, a white van is being driven erratically. The driver is pulled over by the police and questioned. A woman on the street after a long night of drinking never makes it home. A suspect, an arrest, a confession - a case closed? Five years earlier, a thirteen-year-old girl disappeared in broad daylight on a busy London street. Detective Chief Superintendent James Langton headed the investigation, but the case was never closed. It has haunted him ever since. Now there's a confession to this murder, and to yet another. Is it too good to be true? Detective Chief Inspector Anna Travis is pulled into the fray by her mentor and friend and isn't so sure that they have their man. Then the suspect changes his story. this story has everything a totally absorbing story needs---credible but always unexpected plot twists, wonderfully human characters fighting their demons, and great narration with one minor exception. The voices of two minor characters are not well done; come across as mushy. Anna Travis is an exceptionally competent detective in this series. This is one of the best police procedurals written today. LA Plante knows how to write murder mysteries. They hold your attention until the last sentence of the last paragraph. Hicks makes the story come alive. She makes it authentic. Very British in that there is too much detail about the police/detectives (13+ hrs.) personal lives. However, the basic story line is very good. Can't decide if the bad guys were made out to be too smart for the roles they played. But, that is part of what made the story good. The ending was too abrupt. I'm glad I listened. They just keep getting better! As Anna matures so do the plots. Police procedurals at their best. I also like the narrator greatly! 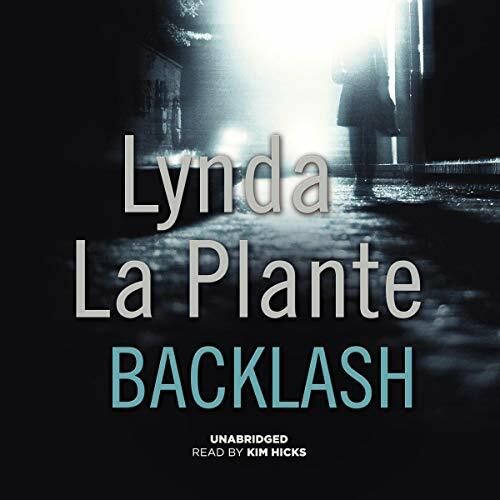 Would you try another book from Lynda La Plante and/or Kim Hicks? I don't think so. Simply don't like the characters. Decided to get a "result " of my own, by not finishing this book. Would you recommend Backlash to your friends? Why or why not? No - would not enjoy. Did Kim Hicks do a good job differentiating all the characters? How? No- sounded all the same. Did Backlash inspire you to do anything?